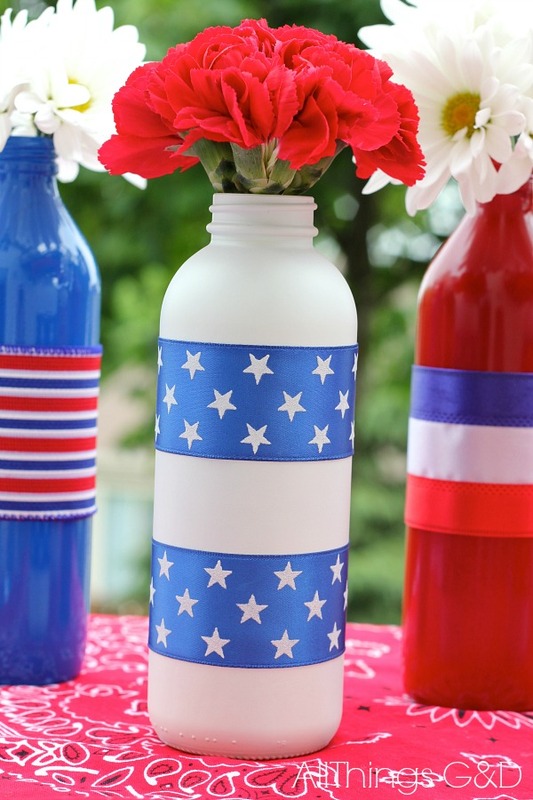 These patriotic painted glass bottles are an easy, low-cost way to add some red, white, and blue to your Fourth of July table! Made from old juice and tea jars, all you need are a few supplies and a few minutes of your time. To start, wash out the jars you plan to repurpose, and remove labels and any residual stickiness. Did you know? 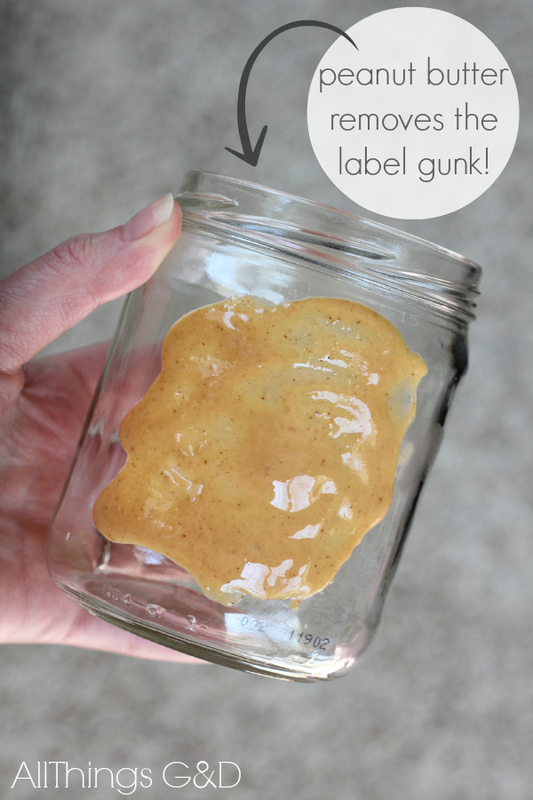 Peanut butter removes the stickiness left behind after removing labels! 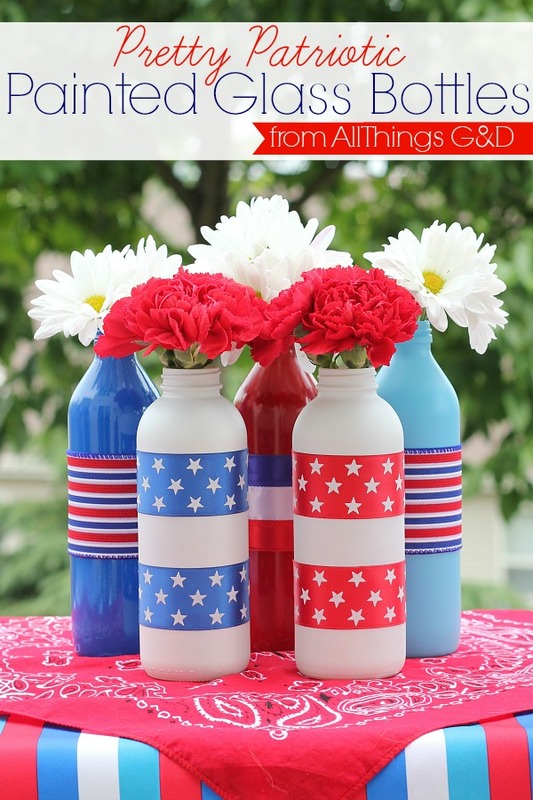 Next, wipe the outside of your clean, dry glass jars with rubbing alcohol for best spray paint adhesion. 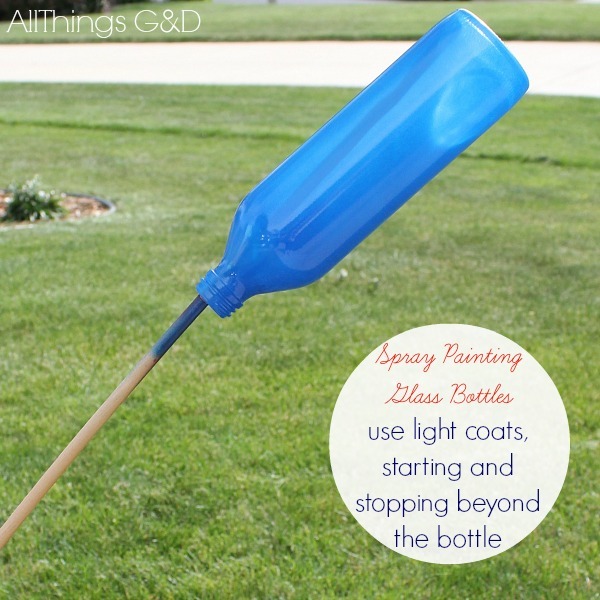 Place jar over a long dowel, rod, or stick, and spray paint using light coats that begin and end beyond the bottle. I used Krylon ColorMaster and Krylon Indoor/Outdoor spray paints for my glass jars and they worked great. I found after my first attempt that the trick is to do the sneak attack. Don’t begin spray painting with the nozzle pointed directly at the bottle. Instead, start spraying like you’re spraying to the left or right of the bottle and then spray the bottle, going all the way and across and beyond it with each swipe of your spray paint. I waited about a minute between my first and second coats, and two coats was all I needed. To dry, I transferred my bottles to a shorter stick (long lollipop sticks work great for this) and stuck the bottles upright, poked into a foam rectangle. I let them dry overnight before I decorated them. 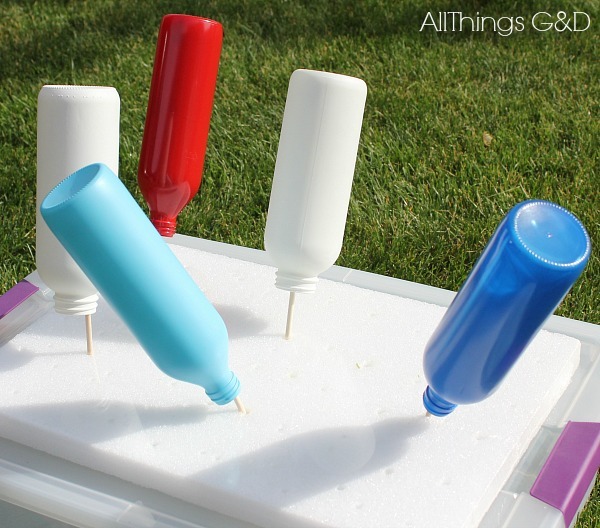 Prop your painted glass bottles up on sticks for perfect, no-smudge drying. 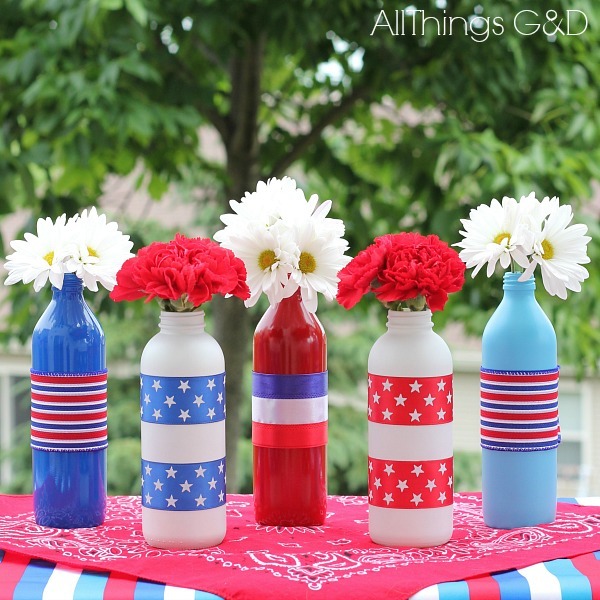 Once the bottles were dry, I used double-stick tape to adorn them with patriotic ribbon. Not only is this a quick and easy embellishment, it can also be removed without damaging your pretty painted jars (just make sure you secure both sides of tape to ribbon – not glass) so you can reuse the jars for other events in the future. Painted glass jars adorned with easy-to-remove ribbon. 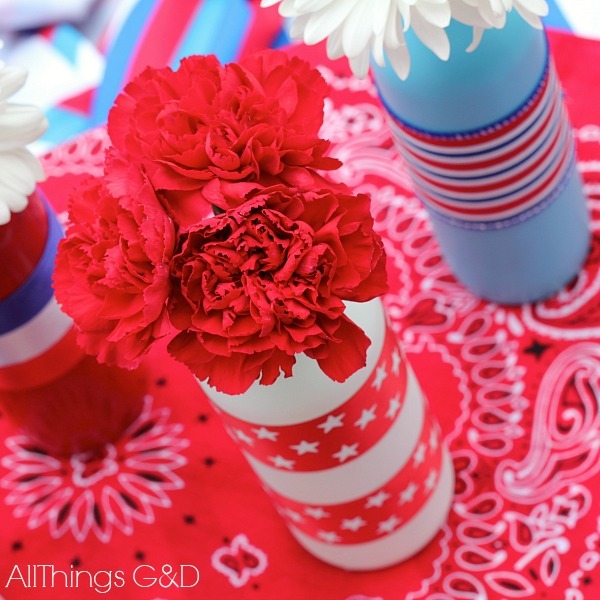 DIY 4th of July vase made from a glass tea jar. Like this project? 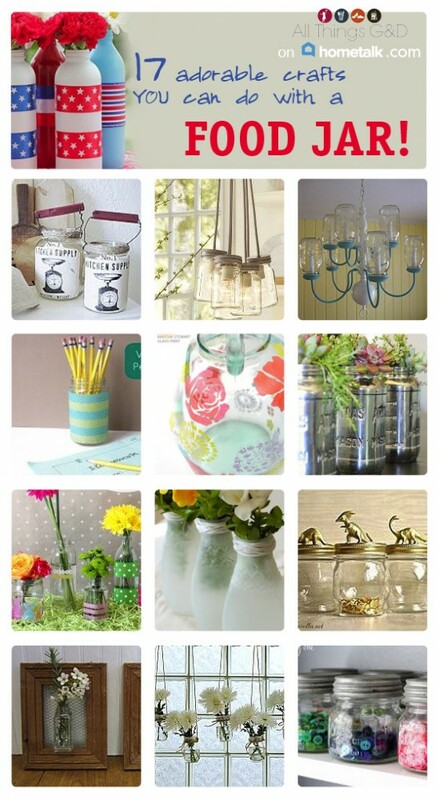 Check out my Kitchen Jar Crafts collection on Hometalk to see 17 unique ways you can repurpose kitchen jars into a fun new project! What a cute, cheap idea! Love it!! Thank you so much, Chrissy!